As we’ve mentioned in our last post, we have celebrated Halloween for the first time this year and have invited some of our friend families with children with the same age of Gabriel to a Halloween party. We have made some scary (funny) food inspired by a lot of things we have found on the internet like a vegetables skeleton, spider pizzas or ghost cupcakes. We have also made bat cookies with this recipe which we’ll probably use a lot in the future because it’s sooooo easy and also quite good. We have also cooked a Jack o’Lantern pumpkin pie with a recipe we’ll share in a future post (we have made its eyes, mouth and nose out of chocolat cookies, as we did for the mouth of the ghost cupcakes. The eyes of the ghost cupcakes were bought on Amazon). 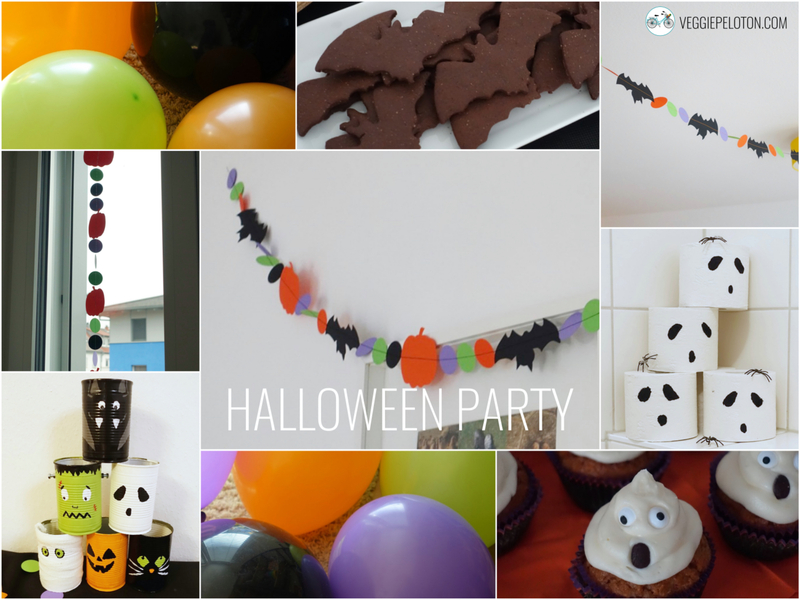 To decorate the living room we have made several paper garlands with Halloween motives. Our inspiration came from the black napkins and paper glasses that we bought at Amazon and which had spiders in violet, orange and green. To fit this color scheme, we made pumpkins and bats and cut paper circles with a circle puncher. We made garlands with only pumpkins and circles, a second one with only bats and circles and a third one with both motives. To put the paper garland together we have positioned the motives and circles alternatively on a surface in order to realize the effect before actually sewing it with the machine. We have also bought ballon with the same colors which were all over the place! We have also organized a few handcraft activities for the kids. We have asked Gabriel to make models so that the children could see what they were supposed to do, so he was quite proud to do it for them! We found inspiration for this mummy on No time for flash cards where we always find such amazing ideas: such a great site! All kids took their mummy home which we hope will be a souvenir of the good time they have spent with us.